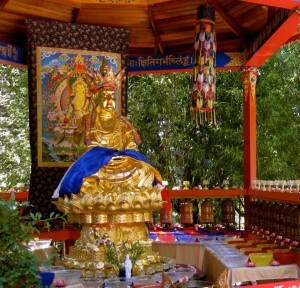 The first weekend in August coincides this year with the anniversary of Shakyamuni Buddha’s first teaching, i.e., Turning of the Wheel of Dharma, at which he taught the Four Noble Truths at Deer Park, Sarnath, India. We will have several practice sessions on Friday evening and during the day on Saturday, Aug 5-6 (Chokor Duchen, the 4th day of the 6th lunar month). See schedule. Several of our resident sangha (monks and nuns) are attending the Light of the Path retreat in North Carolina, led by FPMT’s spiritual head, Kyabje Lama Zopa Rinpoche, August 14-28. Venerable Steve’s class, Our Buddha Potential, will be on hold for a couple weeks, resuming Sep 12. See calendar. However, regular meditations (Sat am, Sun am, Mon pm) and pujas (Sunday afternoon Medicine Buddha puja, Aug 26 Lama Chopa Tsog) will continue to be held at Land of Medicine Buddha during this time. See calendar. Also, a new Discovering Buddhism course starts up on Tuesday, August 16 – How to Meditate – led by Venerable Drimay. This is part of the series of introductory Buddhist courses on various topics that takes about 2-1/2 years to get through. You can jump in at any point. On Sunday of Labor Day weekend, September 4, we hold our annual Ksitigarbha Festival, organized by the local-area Chinese community. All are welcome to join us for prayers, offerings, free lunch, and performances to celebrate the enlightened activities of Ksitigarbha. Location: upper level, Ksitigarbha Pure Land. 11:30am to 3:30pm.